This is just the standard Marvel series trade release. There are no frills and only a few pages of covers, layouts and scripts to pass for special features. And did I mention that it is actually more expensive than the single issues? If you are familiar with the character Deadpool, you are probably aware that he is known to “break the fourth wall” in his comic book and video game travels. This story is essentially about that, except not for a moment of comedy, but instead for the basis of the plot itself. The basics are that Deadpool either goes sane or even crazier depending on how you look at it, and tries to rebel against his controllers by killing his way out of the Marvel Universe. The art work provided by Dalibor Talajic is probably right in line with the tone set for the story. I guess I’d describe the look as more edgy or indy super hero than cartoony or standard super hero. For me the art is neither a selling point nor a detraction from the series. It fits the story but it isn’t going to find its way onto my favorites list. I am not super familiar with Cullen Bunn’s work and can’t say that this trade will lead me to seek out more of it. He obviously gets the basic dynamic of the character but that is used very little as the story quickly goes off the rails and into the “what if” mode that changes the character. That change is the story and it wasn’t something I found all that compelling. 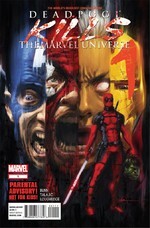 This is not really a standard Deadpool story built around comedy, his failures with trying to kill himself or even his path to better himself in his own unique way. This is basically an attempt to take a comedy plot device (his breaking of the fourth wall) and turn it into a different take on the character’s issues. The blurb on the back of the trade labels the tale as disturbing and even calls it a horror comic. I’m not sure I would go that far because it all seems sort of deadpan to me. There is no suspense built into the completion of his mission and other than a few “Saw-esque” traps, not really disturbing moments given the title of the book. I don’t think the story gives you a reason to really care about what is going on or any swerves or surprises to keep you interested. I hate to be this harsh, but if you’ve read the title, you’ve already read the book. I picked this up specifically to write this review because I like Deadpool and it seemed to get a lot of buzz when it was released. It has a few panels that are sure to be favorites on Tumblr filled with smart/snarky comic book references, but I would not label this as a funny book. In fact, I wouldn’t even say it is a fun book. More or less this is just a book about Deadpool killing a bunch of other characters while alluding to the fact that he knows you’re reading him do this. I honestly wouldn’t recommend buying this unless you are just a die-hard Deadpool fan. But if you must seek out this series, do yourself a favor and save a couple of bucks by getting the floppies instead of the trade.